What did Christ accomplish for us on the cross? What did Christ accomplish for us on the cross? In a word: SALVATION. What, then, is salvation? Is it a momentary event? Is it a lifelong process? Yes. It is all of that. BIRTH: We are born in sin and separation from God (Romans 5:12). DEATH: Someday, we will all die (Hebrews 9:27). Now, for those who place their trust in the saving work of Jesus on their behalf, they experience a CONVERSION. Conversion is just our big Christian word that means “change”. I am changed. My mind is changed. My heart is changed. My life is now moving in a new direction. Another word for this change toward a new direction is repentance. I have repented from being content in my life of sin and separation from God. I have repented from trusting in myself or something else to save me from my sin and separation from God. I have repented from my disbelief in Jesus as the Son of God and as the one and only Savior of the world. 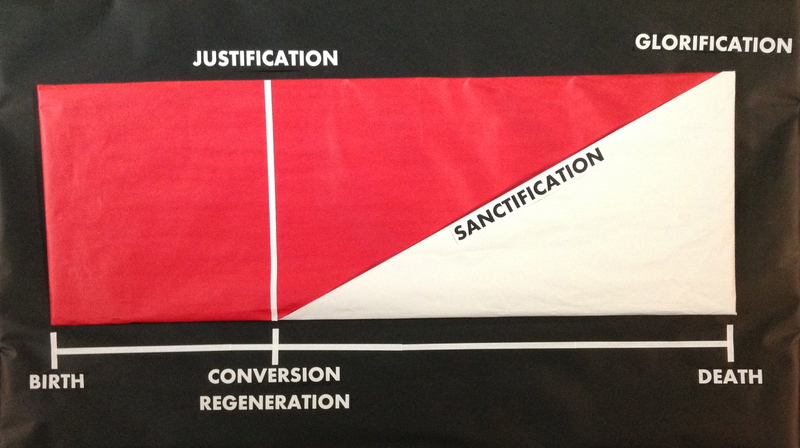 This change – this repentance – is known as conversion. This is new birth. This is regeneration. the dead soul is resurrected to new life. And – listen – this is important – this is why I have a white line there at the moment of justification – in this moment, the power of sin to rule over our lives is broken. Because of justification (signified by the white line), we have victory! Brothers and sisters, that is what Easter is all about! Because of this, we have victory! Because of this, we are more than conquerors! Because of this, we have overcome! Because of this – WE WIN! And in the end of days – when the war with sin is over – we will reign with our Savior and Lord, Jesus, forever in glory. We will enter into the final, eternal stage of our salvation life: GLORIFICATION. This, all of this, is a picture of our salvation. All of this, Christ secured for us by His work on the cross! Salvation is nothing less than the redemption of all that we are back to all that He is. So – here we are – in this in-between time. For those of us who have trusted in the saving work of Jesus on our behalf, we live between new birth – and earthly death. We live between justification and glorification. Jesus has secured our salvation for us. He is actively saving us, right now, as we live in, and love, and follow after Him. And some days – it is so hard. And other days, it is more amazing than we ever dreamed possible! What’s going on? Where are we as we labor and wait between new birth and earthly death, between justification and glorification? Why does it feel like this? That will be the subject of our next post… What is going on in the life of a Christ-follower between new birth and earthly death, between justification and glorification?